This last week has been a busy one with work and a charity event I was involved with. Even though the new Shimano pedals had arrived in the post and I was itching to fit them to the bike, there was no point without the shoes. I had been shopping around on Adverts, and one possibility turned out to be a little too snug. The second outing was more successful. Clearly these had seen some use, but they are perfect for a starter pair, and at 30 Euro, you can’t really complain. 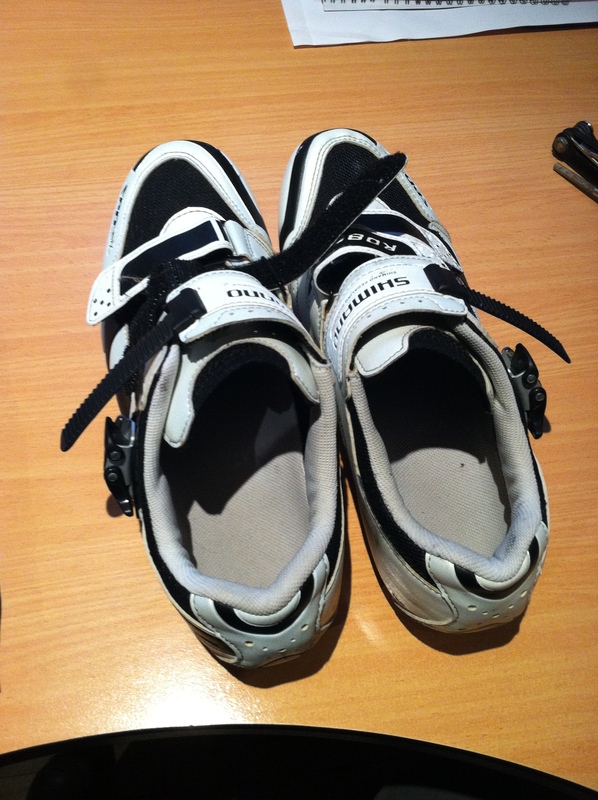 A pair of second-hand RD86 Shimano SPD-SL cycling shoes. I should probably add here that this is the first pair of cycling shoes and cleats I have ever owned. I was always aware that ‘real’ cyclists used this system, but as a casual cyclist, it was never on my radar to investigate it any further. 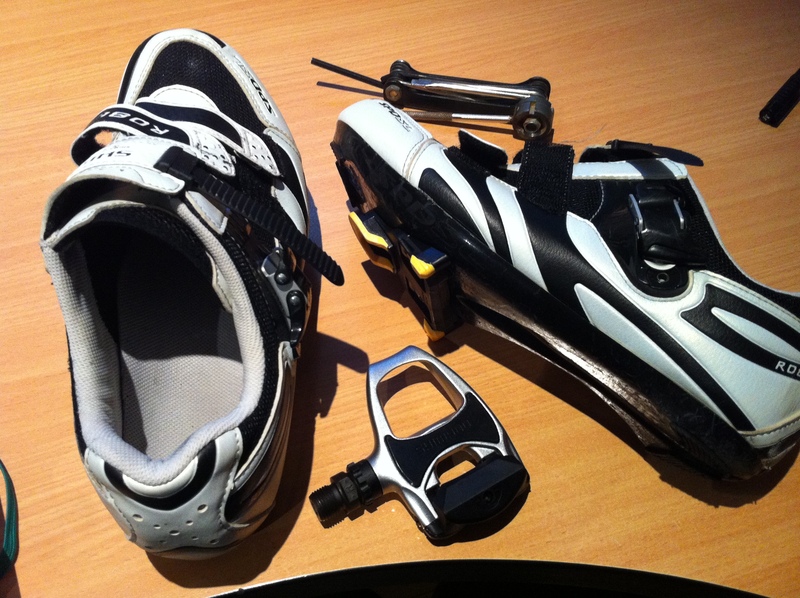 Once I started doing triathlons last year, it was hard not to notice that pretty much everyone else was using cycling shoes with clip-less pedals. Of course, these shoes were fitted to rather smart-looking bikes too; my own bike is a steel-framed 1980s racer. A good pedigree, I should add; Mercian Cycles are a well-known and respected make in the cycling world, but this has all been part of the learning curve for me; a curve which shows no sign of leveling off. Regular triathletes will be familiar with all the tricks of course. When I was lining up to get into transition with hundreds of other competitors for my first triathlon (a sprint event in Athy last year) I was fascinated to see the shoes clipped to the pedals and held at the ideal angle for quick access with rubber bands that would quickly break once you slotted your feet in and got going. The pedals are a new set (Shimano PD-R540). 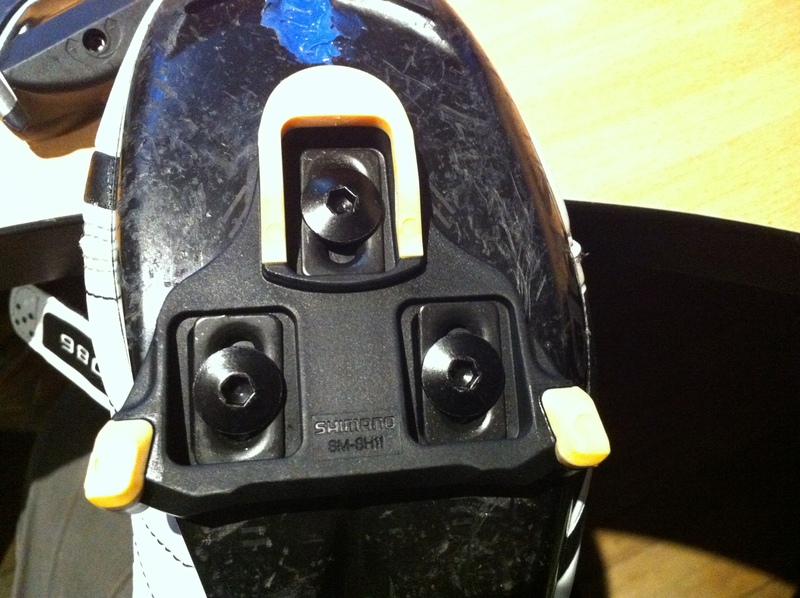 As of yet, they have not been fitted to the bike to replace the toe straps that are currently there. I did have at least one embarrassment in those, in the park, and I fully expect to have a good few more of these with the clip-less variety. Practice, practice, practice, would seem to be the motto here, and preferably somewhere where falling over won’t be too detrimental to your health. It would seem that falling off your bike with these style of pedals is about as common as falling off a bike when you are learning to ride as a kid. So that’s something new to look forward to, in the journey towards becoming an Iron Man. More on this after the maiden voyage! New cleats on old boots.